Everyone deserves a holiday, and we’re huge proponents for making these as fun and accessible for people with a disability as possible. When we heard that Peter Giller and his partner Shannon Edwards were coming down specially from Queensland to take his brother Mark to Bulli (near Wollongong, NSW) for a holiday, we wanted to know how we could help. Unfortunately, the family were struggling to find anyone who could help with Mark’s additional needs in the local area, but when Mark’s Support Coordinator from up in the Blue Mountains called us to ask for one-off assistance, we were more than happy to rise to the challenge. Zest Care operates an office in the area, and so the amazing Hannah in our office sent two support workers to work with the family and ensure that they had an amazing time. Hannah’s part in this should not be underestimated, with the family admiring her professionalism and role in bringing everything together. Shannon took the time to email us to let us know that the two individuals that were sent to support were “delightful, caring and competent people”. She couldn’t speak highly enough of both of them. Anke, known for her positive can-do attitude, took one day. Lawson, who at the time was very new to the company, took the other. The family were excited for Mark to use his incredible wheelchair at the beach, which was specially designed to be able to go on the sand and in the water. This was provided by Thirroul Surf Life Saving Club, which indicates an additional layer of community support for people with disabilities. 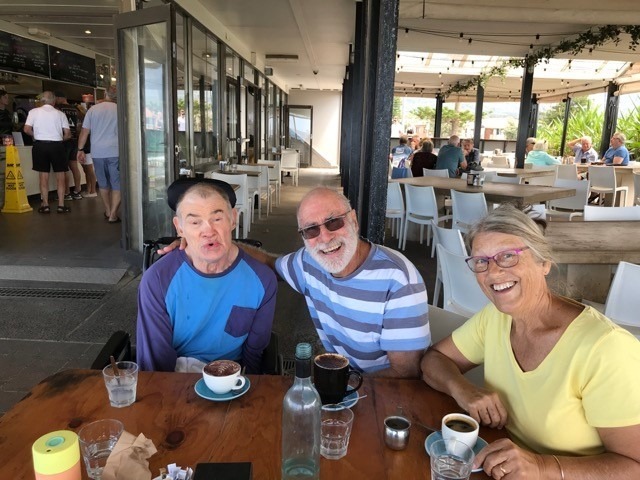 While Mark didn’t feel like going into the surf, they were still able to make sure he took part in a range of activities, and that he enjoyed his stay at the accessible caravan park in Bulli. Here’s what can happen when Zest says “yes!”. We’re really thrilled that the holiday was a success.